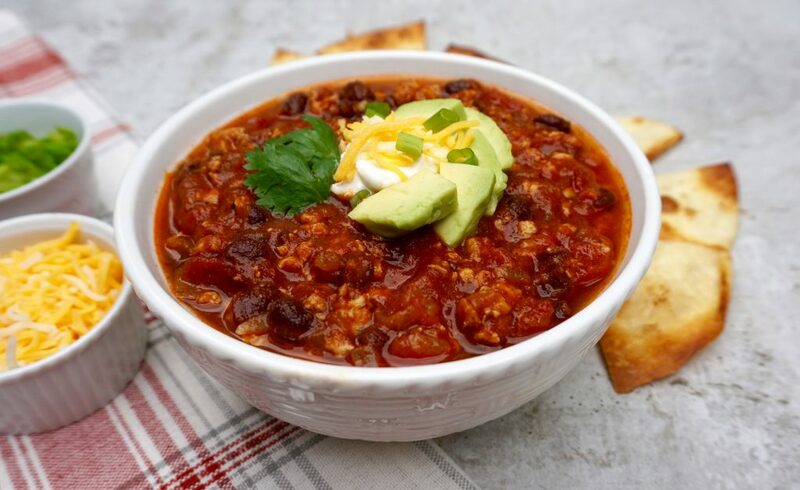 Chicken Chili is a hearty, flavorful and healthy low fat chili. Fall is for soups and chili! 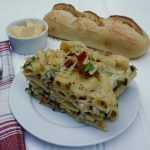 Warm and hearty foods for coolers days. 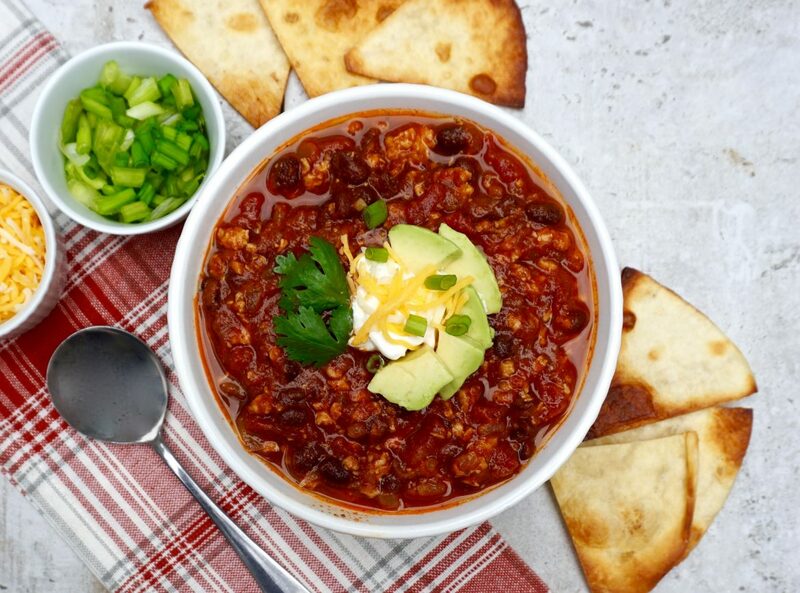 If you are looking to make a chili that is a little bit healthier, try this Chicken Chili. 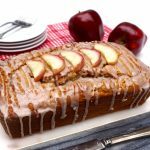 It is hearty and filling with just a touch of heat and very little fat. Lean ground chicken is the base so it is low calorie. If you want to you can actually grind your own boneless chicken breast in a food processor. Just cut off any fat before you grind it in order to get a very lean meat. 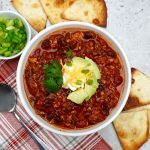 The best thing about this Chicken Chili is that it is healthy enough to bring for lunch every day! You could make a pot on the weekend and be set for the entire week. It it also a great thing to make on a Sunday afternoon and eat while you are watching football! Heat the oil in a large stock pot over medium low heat. Add the onions and garlic and cook until they start to soften. This will take about 3 minutes. Do not let them brown. Add the ground chicken to the pot and cook stirring until it is cooked all the way through, about 5 minutes. If the chicken starts to clump, break it up with a knife and fork. 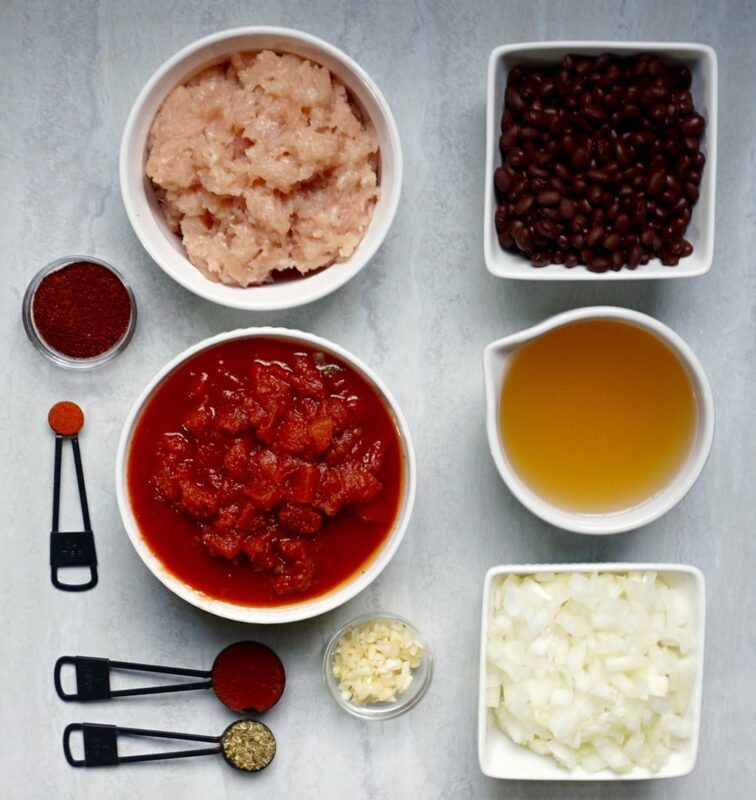 Add the diced tomatoes, chicken broth, 1 tablespoon of the tomato paste, black beans, chili powder, oregano, paprika and cayenne pepper. Raise your heat to high until the mixture begins to boil. Turn the heat to low and simmer uncovered for 45 minutes, stirring occasionally. The chili will thicken as it simmers. Add the second tablespoon of tomato paste only if you want the chili to be a bit thicker at the end of the cooking time. If you do add the additional tomato paste, let the chili simmer a few more minutes. Serve with shredded cheese, sour cream, green onions, avocado.